Earlier this year, when the Maharashtra government had introduced the plastic ban, one was happy that at last some action was being taken and a stringent one at that. One hoped too it that would see a drastic reduction, if not complete elimination of the infernal thing from landfills and water bodies. One thought, ‘Well begun is half done’. Alas, nearly a year later, nothing seems to have changed, for the better that is. When the ban came into force, there was a great deal of enthusiasm, the fear of prosecution, not to speak of, a sense of social responsibility. Vegetable vendors at the market completely stopped giving these flimsy bags to their customers and the latter had started carrying their own shopping bags, grumbling but carried them nevertheless. For, they knew that no matter how much they whined and wangled, they wouldn’t get a carry bag. The ban looked like it might succeed after all, since it had worked even during the monsoon. Flower sellers and small vegetable shops began wrapping their ware in newspaper bits, much like they used to, in my childhood. Municipal garbage trucks refused to take bins that had the banned plastic items. Large shops and grocery chains shifted to paper bags and the smaller had begun following suit. Alternatives to plastic entered the market, though some were as hazardous as plastic. Shops added a few rupees if one wanted a bag. Big shops sold large cloth grocery bags. One rejoiced. Too soon, alas! For one had reckoned without vested interest lobbies. The government was being arm-twisted and rather forcefully at that to roll back the ban. It did, for three months. That would cover the monsoon! The extension was ostensibly for people and manufacturers to clear their stock and find alternatives. But it apparently was not just that. The slide had begun, almost imperceptibly, and the odd bag started appearing. When questioned, the shopkeepers said that they were just getting rid of their stock. Soon the shoppers began demanding them, in belligerent tones, a big change from the pleading of a few months ago. Some were still shamefaced though, but not all. One heard that even housing societies continued supplying the black garbage bags to their residents. Segregation of waste became half-hearted. Clearly, the manufacturing lobby was winning. But there are others like silly me. I line my wet-waste garbage bin with newspaper (at least some good use for a useless item!) and carry my own shopping bags. In fact, I I have been carrying them for years now. I sometimes take the fridge bags and get the vegetables in them. Less work of putting them away, that way! Recently I discovered this cool vegetable bag. Okay, okay, it has been there for ages, but slowpoke that I am, I discovered them only now. 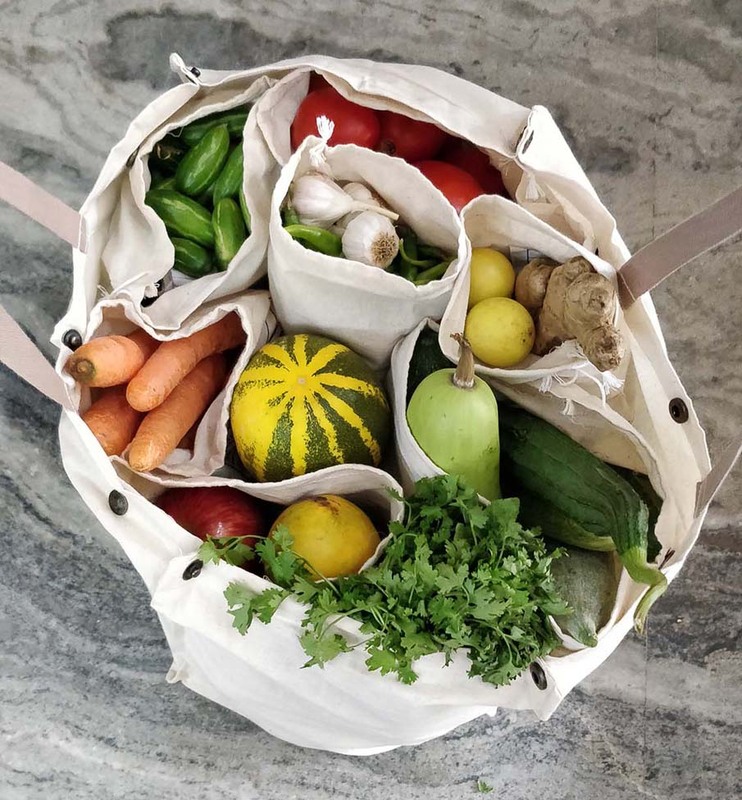 A large canvas bag with several pouches that can segregate the veggies without them getting mixed up and quashed. Though the online ones cost a lot, you can buy them locally or even have it stitched by your tailor. Go get yours! A couple of days ago, I had gone to the vegetable market. The vegetable seller was asking people for their bags. Except for another woman and I, the rest – about four of them, both male and female – didn’t have any bag. They were demanding for carry bags, in tones ranging from belligerence to a meek whine. Mind you, they were all young, and one would have expected them to be more environment-conscious and responsible. I told them how they could do it – keep a cloth.nylon bag folded in one’s handbag, or keep some spare bags in the car. They gave me looks of the kind reserved for elders, who give ‘unsolicited advice’ but have-to-be-tolerated (eye-rolls included). Later, I asked the vendor why she stocked the bags at all, she said, ‘People don’t bring bags and if I don’t give them, they go to the shop where they do. Besides, the bags are still being made and sold, so why not?’ Logical reply indeed. So how come these bags are still being manufactured? The ban had been ill-timed and ill-conceived to begin with, without proper checks and measures in place, especially as it had come into effect just before the rains. The government was forced to extend the date of implementation, again with dire warnings. There were other lobbies, including those that manufactured these bags, who were twisting its arm too to dilute the ban, as I pointed out earlier. Like so many other schemes, this one seems to have gone the ‘committee’ way, which means it would never be implemented properly or fully, in the near future, anyway. Another government, another lobby(ies) and it would be back to square one! All the high decibel sloganeering and threats have all died down to a whimper, if at all one can hear them. The one-time-use-plastic-bags (and God knows how many other banned plastics) are back in the shops and all is wrong with the world! Should we then say, Well begun, half done? After all, a punctuation is all that is needed to make a right thing wrong! It’s such a pity isn’t it…but then enforcement of any kind is a pipe dream in India. It is even more of a pity that enforcement is needed before people comply with rules and laws that are only good for them! Take helmets for instance. The fools who avoid wearing them don’t realise that they are endangering their own lives and try to subvert the law as best as they can. I will not blame the government. The people are responsible for using the ban effectively. At least I have been requesting people whenever I go out to buy vegetables on street….. And try to teach people not to ask for plastic bag. At least you will fine that the but f shops has stopped using plastic bags. They have replaced with paper bags. My son who runs a laundry shop in bandra west has replaced bags with paper bags. He must have thrown away nor less than material worth one lakh. So it’s finally us who have to show the courage. not blaming the government completely, Rameshwar, just their buckling under pressure from vested interest and not taking alternative measures to aid the abolishing of plastic, at least the single-use bags. It is very commendable of Karan to have destroyed his expensive stock of the plastic bags. But as I have said, all youngsters are not so environment conscious. They are the ones who are most vociferous and belligerent when they demand for the bags! These are the kind that would only listen if they have a fine or punishment coming their way. ← With Rama in my heart….